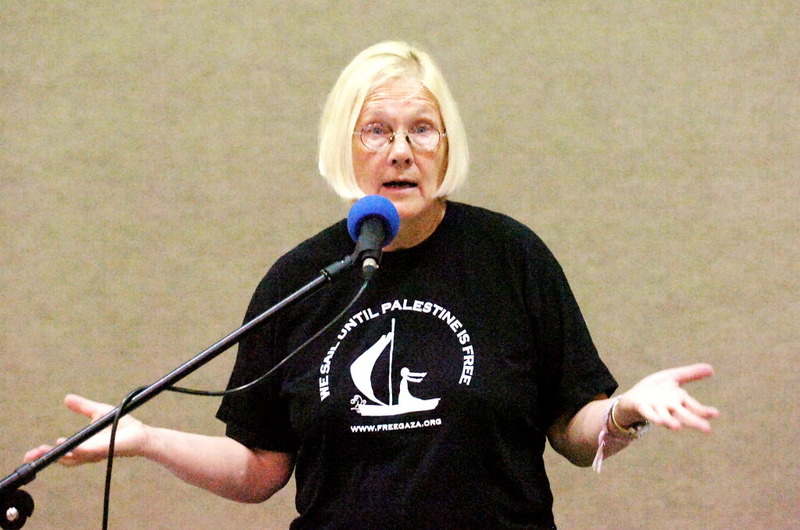 Introduction by Gilad Atzmon: The adorable solidarity activist Ann Wright, former US Army Colonel and retired official of the U.S. State Department, known for her outspoken opposition to the Iraq War and support of Palestinian rights, is now also subject to Palestinian solidarity internal war. On her way to meet up with the Swedish Estelle, the next boat to challenge the Israeli blockade, Colonel Wright was called by a board member of the Estelle who ask her to abort the journey. She was disinvited. The explanation was embarrassingly lame - Ann Wright is a member of the new Free Gaza Movement’s Board. She supports Greta Berlin. It didn’t take me more than a few minutes to find out that the leader of the current attempt to sail to Gaza is Israeli Jewish activist named Dror Feiler. Feiler is the chairman of the Jews-Only Swedish organization Jews For Israeli Palestinian Peace (JIPF) and the European Jews for Just Peace (EJJP). Once again it is the Jewish activist who decides who should be on board in the Palestinian Solidarity movement. I can’t make up my mind whether this is funny or tragic. It is certainly very bad news. The board representative acknowledged that the reason for their invitation to me to be on the “Estelle” was that I am a retired US Army Colonel and former US diplomat who resigned in March, 2003 in opposition to the Iraq war, that I am a vocal critic of Israeli and United States policies on Palestinians and that I have been to Gaza 4 times in the past 3 years, assisted 7 groups to go to Gaza in 2009, helped organize the December, 2009 Gaza Freedom March, was a passenger on the 2010 Gaza Freedom Flotilla, helped organize the 2011 US Boat to Gaza and am an organizer for one of the latest initiatives, Gaza’s Ark. But, because I am a member of the new board of the Free Gaza movement, and despite the fact I, and Greta and all members of the new board have made public statements posted on the Free Gaza Movement’s website that neither Greta, nor members of the current or previous board are anti-Semitic, bigoted or racist, the fact that I am on the new Free Gaza board was the reason the board of the “Estelle” was withdrawing the invitation for me to sail on the Estelle due to allegations of anti-Semitism of the Swedish Boat to Gaza by pro-Israelis groups in Sweden. I am saddened by the decision of the board to withdraw its invitation and I believe it is wrong. All of our projects that have challenged Israeli policies toward Palestinians have been called anti-Semitic by pro-Israeli groups. This is not a new tactic used to scare pro-Palestinian groups. Phil Weiss and Adam Horowitz in an article posted on Mondoweiss http://mondoweiss.net/2012/10/no-room-for-racism-in-a-movement-working-for-equality-and-freedom.html said – “there is no room for racism in a movement working for equality, justice and freedom for all in Israel/Palestine”---and they are right, but at the same time, there is no room for throwing long-time international activists for Palestine “off the boat,” so to speak. Greta Berlin is not an anti-Semite, a bigot or a racist, and neither am I.
I wish the passengers and crew on the “Estelle” a safe voyage in challenging the Israeli naval blockade of Gaza and call for all who support Palestinians to keep their eyes on the prize—justice, dignity and freedom for Palestinians who are suffering under unjust Israeli policies and actions.